^ "Charles (I)". Encyclopædia Britannica. Encyclopædia Britannica Online. 2014. Retrieved 20 October 2014. 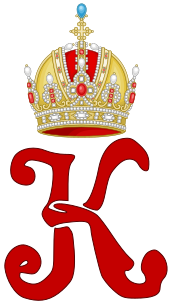 ^ "Blessed Karl of Austria". Emperorcharles.org. Retrieved 3 January 2018. ^ a b c d Pribram, Alfred Francis (1922). "Charles" . In Chisholm, Hugh (ed.). Encyclopædia Britannica (12th ed.). London & New York. 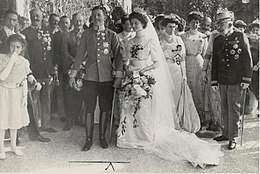 ^ "Charles Carried into Exile on a British Ship As Napoleon Was; Zita to Bear Another Heir" (PDF). The New York Times. 5 November 1921. Retrieved 20 October 2014. ^ "Charles St. Helena Likely to be Funchal" (PDF). The New York Times. 6 November 1921. Retrieved 20 October 2014. ^ "Charles of Austria Dies of Pneumonia in exile on Madera" (PDF). The New York Times. Associated Press. 2 April 1922. Retrieved 20 October 2014. 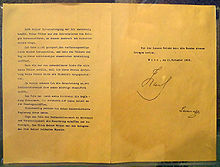 ^ "Pope Benedict XV's Peace Proposal - World War I Document Archive". Wwi.lib.byu.edu. Retrieved 3 January 2018. ^ By ALAN RIDING, Special to the New York Times (15 April 1989). "Rome Journal - Vatican 'Saint Factory' - Is It Working Too Hard?". NYTimes.com. Retrieved 3 January 2018. ^ "Kaiser Karl Gebetsliga für den Völkerfrieden" [Emperor Charles Prayer League for the Harmony of Peoples] (in German). Emperor-charles.org. 2011. Retrieved 20 October 2014. ^ "Emperor and mystic nun beatified". BBC News. 3 October 2004. Retrieved 20 October 2014. ^ "Historiker: Giftgas-Einsatzbefehl durch Karl I. war "Notwehr"" [Historian: poison gas use command by Charles I was "self-defense"]. Der Standard. 5 October 2004. Retrieved 20 October 2014. ^ Pinsky, Mark I. (8 February 2008). "Baptist woman from Kissimmee edges Austro-Hungarian emperor toward Roman Catholic sainthood". Orlando Sentinel. Retrieved 20 October 2014. This page was last edited on 21 April 2019, at 22:37 (UTC).